Synergy Spirulina is produced by the world’s first and largest producer of Spirulina. Extensive research and development over twenty years has resulted in a Spirulina with the highest levels of all nutrients. It is grown ecologically without pesticides or herbicides and carefully dried in a few seconds preserving full nutritional value without any chemical additives. 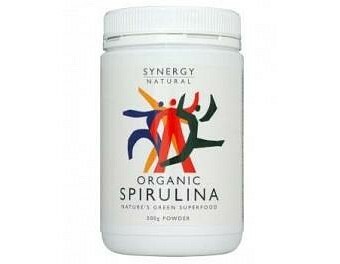 With Synergy on the label, you can be sure you are getting the finest, purest, most potent Spirulina available. WHAT IS SPIRULINA? Spirulina is the Richest Whole Food Source Found in Nature A highly nutritious, microscopic freshwater plant. The superfood with over 100 nutrients, more than any other plant, grain or herb. Widely used as a food supplement for maintaining health, energy, weight loss and cleansing programs. Protein - 60-70% of its weight. 300% more protein than fish, meat or poultry, with no cholesterol Iron - 58x richer than spinach in bi-available iron. Vitamin B12 - Natures richest source. Often lacking in a vegetarian diet. Chlorophyll - 2x richer than barley grass or wheatgrass. Anti-oxidants - 25x richer in beta-carotene than carrot and 3x richer in Vitamin E than wheatgerm. Spirulina assists weight loss by curbing appetite naturally while supplying a full range of nutrients needed for a balanced diet. As an unrefined wholefood, spirulina is absorbed up to x16 more effectively than synthetic multi-vitamin and mineral supplements.